Using Powershell for bulk SSH commands on Fortigate firewalls, etc. http://www.powershelladmin.com/wiki/SSH_from_PowerShell_using_the_SSH.NET_library. As an example, I’ve built a quick power shell script as an example of how this can be used. 1.) Populate a list of your firewall IP addresses in a CSV firewall called Firewalls.csv. In my next post I’ll cover using pscp.exe to backup your firewall config in a PowerShell script. Have had a couple of requests for setting up Spanning Tree on Procurve 2530 & 2920 switches recently. It’s extremely straightforward & can be done via CLI with Telnet or through the Web Management. For the CLI, connect via Telnet to your switch IP address. 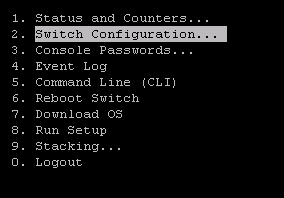 Type in menu from the CLI to bring up the configuration menu. Select option 2 for Switch Configuration on the 1st Screen. Select Option 4 for Spanning Tree Operation from the next screen. Select Edit and press Enter from the bottom menu, use your arrows to select STP Enabled & Space Bar to toggle the selection to Yes. Press Enter to go back to the Actions Menu and Select Save to save changes.